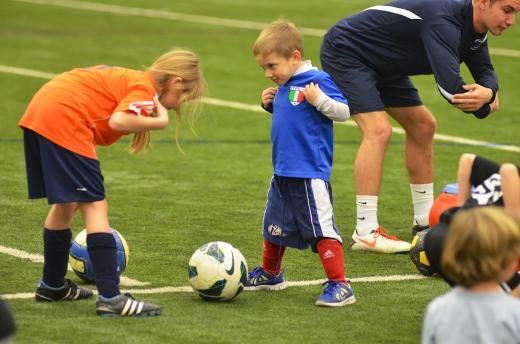 Photo coutresy of the Brady Family: Zachary Walma, cousin of the late Mack Brady, takes part in the Second annual Mack Brady soccer clinic, which was at Holuba Hall on Sunday night. Brady passed away in 2012. UNIVERSITY PARK — On a cold and damp winter evening, over 100 children came together to remember the life of Mack Brady. And they did it by playing soccer. Inside Holuba Hall at Penn State on Sunday night, the youngsters ran through cones, took shots on goal and practiced with the men's soccer squad at the Second annual Mack Brady Clinic. Mack died on Dec. 31, 2012 at the age of 8 as a result of a blood infection. Mack's father, Christian Brady, dean of the Penn State Schreyer Honors College, took a moment to reflect on the past year. Last year's clinic was such a success, that the Penn State men's soccer team decided to do it again. According to Penn State men's soccer coach Bob Warming, the event is special to him and his team. So, on Sunday, music blared and children laughed as they bounced colorful soccer balls through Holuba Hall. The event was open to children in kindergarten through eighth grade. It was a scene not unlike last year. According to Brady, the event will happen every year. There were youth soccer players from State College, Bellefonte, Altoona and Hollidaysburg at the clinic. John Lundy, who coaches soccer in the Penn United Soccer Academy in State College, was impressed with the clinic and the turnout. Mack played goalie for his squad. With that in mind, Warming spent extra time on goalkeeping Sunday night. Those taking part in the clinic got to watch Penn State keeper Danny Sheerin dive over and onto mats in an effort to the ball out of the back of the net. The children cheered and clapped to “pump up” Sheerin as he dove after countless shots on goal. Warming was happy to see the children enjoying themselves. While the clinic was free of charge, those attending could make contributions to the Mack Brady Memorial Men's Soccer Fund, which funds scholarship for Penn State soccer players. At the end of last year, contributions had reached over $150,000. As the event wrapped up Sunday night, Warming had some final thoughts. To support the fund, memorial gifts may be made online at http://givenow.psu.edu/MackBrady or by sending a check, payable to Penn State with “In memory of Mack Brady” in the memo line, to: Penn State University, One Old Main, University Park, PA 16802.